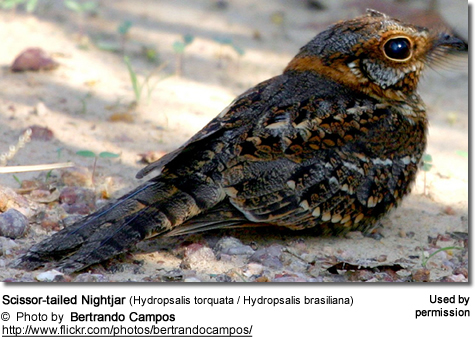 The Scissor-tailed Nightjar (Hydropsalis torquata / Hydropsalis brasiliana) is a member of the nightjar family. Some authorities use Hydropsalis brasiliana for this species based on a drawing and a written description, which may actually be of another species. Due to their cryptic appearance, they blend perfectly into their habitat and are very difficult to spot during the daytime, when they are usually hidden away sleeping. These birds are most easily detected at night when light from car headlights are reflected ruby-red from their eyes, as they are sitting on tracks or roads. However, their presence is most often made known by their loud calls given at dusk. 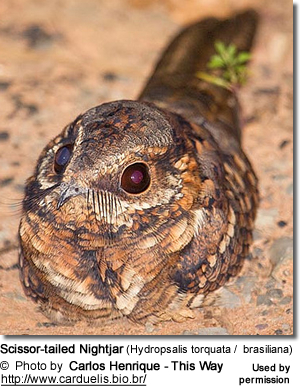 The Scissor-tailed Nightjars are native to central and eastern South America, where they have a wide range. They occur in as far north as Suriname and potentially the Guianas (northwestern part of South America). In Brazil, they are mostly found south of the Amazon River; a significant number of them occur in the state of Bahia in the Chapada Diamantina National Park aka Parque Nacional da Chapada Diamantina. Their range also extends west to eastern Peru, south to eastern Bolivia, Paraguay, Uruguay to central Argentina. Its natural habitats are dry savanna, cerrado, subtropical or tropical seasonally wet or flooded lowland grassland, forest, forest edges, heavily degraded former forest and urban parks. Within its range, this species is described as 'fairly common' (Stotz et al. (1996). East central Peru east to the Amazonian in western and eastern Brazil, north to northern Peru and southern Surinam. They are medium-sized nocturnal birds that average 16 inches (40 cm) in length, including their long tails that account for about 66% of the total length. They have been named for their scissors-like tails, which also help with identification. 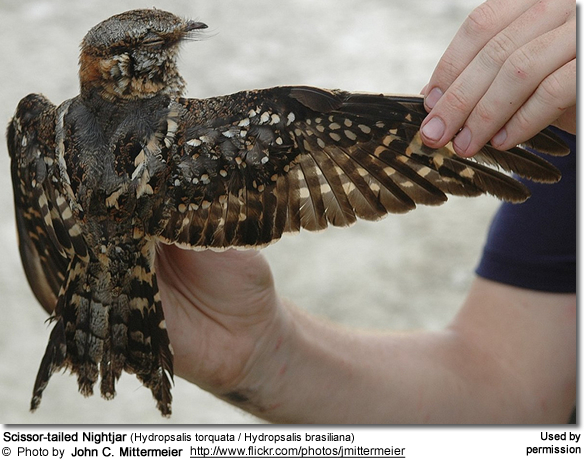 Like all nightjars, they have very short bills, pointed wings and short legs and small feet. Their soft plumage is cryptically colored to resemble bark or leaves. They blend perfectly into their habitat, making them very difficult to spot during the daytime, when they are usually hidden away sleeping. Both the male and the female have a distinctive reddish-brown collar around the back of the neck. The male's outer tail feathers are whitish and very long outer tail feathers (possibly longer than his body). The female also has a long tail, but not as long as the male's. Their presence is most often made known by their loud calls given at dusk. 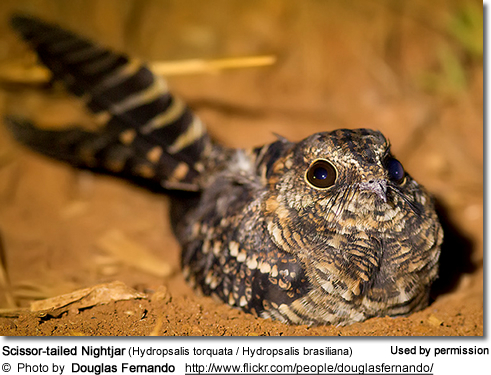 The Long-trained Nightjar is the only other nightjar with a long-tailed male. However, this species is considerably larger and has a crowned streaked with black. The down-covered chicks are able to make short-distance movements within 24 hours of hatching. The male usually stands guard and defends the nest and the young. He will hover in place near the nest with his body in a nearly vertical position. The parents communicate with their young via soft clucking sounds to which the chicks respond. The chicks are fed regurgitated food (insects). Their parents continue to brood them until fledging. The chicks take their first flight when they are about 20 to 21 days old.